Over on Bike Radar they announced that Danny MacAskill’s street bike he used in the amazing videos Way Back Home and Industrial Revolutions videos is now available to the general public! 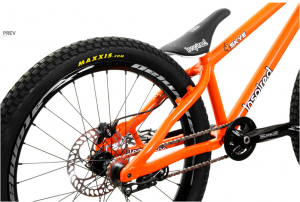 This new model from Inspired Bikes is called the ‘Skye’. Which is aptly named after the small Scottish Island where Danny grew up. The Skye has been designed specifically for riders who want too go big! So as you can imagine a frame that has been built for Danny MacAskill must be incredibly tough. The full bike build does sound impressive and Inspired have spent a lot of time to get this bike exactly how Danny MacAskill wanted it to feel. The Inspired Skye has been fully kitted out with a shed load of top of the range parts as well. The last thing you want if (you are like Danny), when your front flipping off a 10ft wall is for your free wheel to skip. So this bike comes with Hope Pro hubs front and rear, bomb proof Atomlab Pimp wheels and Truvativ cranks. As you can imgaine the Inspired Skye does come at a price. Complete bike is around £2,299, with the frameset set at £1,299. If you need any more info of the Inspired Skye, please visit the Inspired Bicycles website. A awesome looking bike, and we certainly would like to get out grubby little hands on one .